Do you have a go to drink? There's been some discussion about what to order when you don't trust whoever is making your drink. Mine changes seasonally - the fall and winter are for drinking cold beer and spring and summer are best sipped in cocktails. 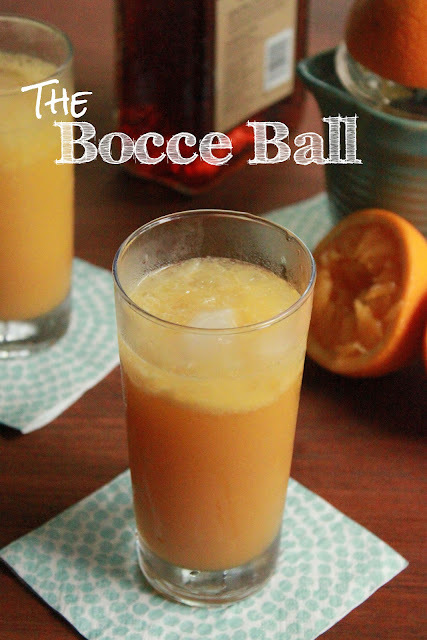 The Bocce Ball has become one of my favorite drinks to have at home. When I first discovered it I didn't really pay much attention to the orange juice. Whatever was in the fridge was fine. Recently Nealey wrote about her twist on the go-to-classic: the Screwdriver. She insists that fresh squeezed juice and some soda water totally elevate the drink. She's right, ya know. And so this weekend when I reached for my bottle of amaretto, I took a few extra minutes to squeeze some oranges - ah, who am I kidding - I totally made my husband do it. We enjoyed them, anyway, on Mother's day morning before brunch with our family. And that's the nicest thing about the Bocce Ball - its familiar like the screwdriver, but just a tiny bit classier. Wouldn't you feel nicer offering your brunch guest this than a tool? Fill a collins glass with crushed ice, add the vodka and amaretto and top with orange juice. Stir and add a splash of soda water. Garnish with an orange slice, if desired. pst. I'll be back tomorrow to announce the winner of the hamilton beach mini blender. That drink is like my dream come true. I'm such a sucker for amaretto. I could drink it straight over ice. Looks very refreshing! Yes - how is amaretto so freakishly delicious? I think we should probably have a drink together at some time, just saying.